Hospitals across the country have seen increases. 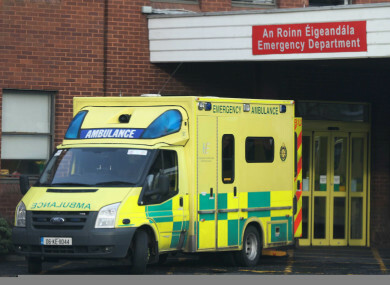 ALMOST 160 PATIENT safety incidents occurred at Irish hospitals each day last year, according to new figures released by the HSE. The figures were released following queries by Fianna Fáil and revealed a 19% increase in patient safety incidents last year compared to the year previous year. The incidents are collated across eight years in seven hospital groups with a total of 58,292 incidents reported last year, an increase of 9,140 on the previous year. These figures translate to 159.7 incidents per day for 2017 and 134.3 per day for 2016. A patient safety incident is defined as one where a patient is either injured during the provision of healthcare or where they were at risk of injury or where injury could have occurred but was prevented. The HSE says that such incidents are reported to the State Claims Agency which then collates the figures. The HSE says, however, that no figures are available for the disciplinary actions taken as a result. Reacting to the figures, Fianna Fáil’s Dara Calleary said that while he understands that the increased number of incidents does not necessarily mean more patients were injured, the geographical discrepancies are worrying. “The significant regional variations are a concern,” the Mayo TD said. The Saolta Hospital Group (which includes Galway, Mayo, Sligo and Letterkenny hospitals) experienced a 44% increase, while the South/South West Hospital Group saw an increase of less than 5%. Email “Injuries or near-injuries of patients at Irish hospitals jumped last year ”. Feedback on “Injuries or near-injuries of patients at Irish hospitals jumped last year ”.